Ali and Fatimah are playing rope jumping in their lawn . ALI AND Fatimah come here, its refreshment time. You got out said Fatimah to ALI. Mama rope didn’t touch my foot but Fatimah insists that it did. Now I will tell you what is rope of ALLAH? 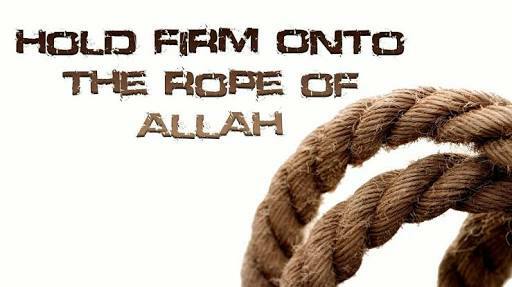 According to Scholars, by holding on to rope of Allah means following teachings of Noble QURAN and Sunnah of PROPHET ( PBUH). So what you will tell us today? Today I will give you a little introduction of Noble Quran. Quran is words of Allah for his creation, revealed on Prophet Muhammad (PBUH) through angel JIBRAEEL almost 1400 years ago and it exists in its original form till now. As through Quran Allah is talking to his creation so in Quran ALLAH (SWT) conveys his message on numerous topics which cannot be covered in one little book.I will tell you main subject areas of Glorious Quran. If ALLAH (SWT) is saying us to follow teachings of QURAN for life then what it means ? Very Good Fatimah ,noble Quran has guidelines for us on how to live our life. Allah SWT tells us what are the qualities of GOOD PEOPLE and what are the rewards if we follow them. Then noble QURAN is full of interesting stories of past and some earlier prophets. It also tells us about the things which we should avoid as Muslim as they are harmful for us. It contains solution to our problems of life, so we should refer to it on daily basis for guidance. Ok, Now I want to ask some thing from you ALI. If you have exam of ENGLISH next week ? How will you prepare for it to get GOOD MARKS? I will study from my textbook and notebooks. Same is the case with this world,QURAN is our guide to pass our exam which we all will have here after. You cannot pass the exam without reading Quran .and important thing is it is in Arabic language,As we cannot understand it so first you should learn how to read it then also learn what it means with help of translation . Then IN SHA ALLAH You will be able to understand its Meaning.and can take guidance from it. I am the first time reading your blog today and I like your story very much. It is a nice style to incorporate a short Islamic lesson into a childrens’game. It is the way how it should be. You should definitely think on writing a book of short stories for children. I am sure it will become a best seller! Jazak Allah…well i am also in my initial stages ….Only if Allah enable me to do this ..i have this blog and fb page on which i share little things….but there are Ma sha Allah wonderful mums in this group and there work is super amazing….May Allah enable all of us to be righteous example for our kids to follow. I love stories like this that incorporate a lesson. I feel it is better to have simple and short stories that get the point across. JazakAllah khair for sharing. Was just wondering, do you intentionally leave out the speech marks when they are talking? Well.JazakAllah kher..i am trying my level best to keep stories short as well as easy to read for kids ..
.Yes…you find them inappropriate in story ? I liked how you incorporated the beautiful advice into a mundane circumstance. If only adults too were this easy to convince. It’s a great idea to incorporate Muslim morals into a short story. I particularly loved this one! Children learns so much from the stories we tell them.